If you are looking for a thick, stew-like dish, this is not it. The end result here is a clear, rich broth, like a consomme. This soup is a study in delicious simplicity; with only three ingredients, the essence of each rings clear in the end result. 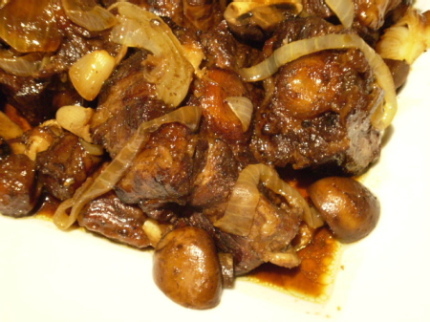 Oxtails contain a large amount of gelatin, which flavors and adds body to the broth. Rinse oxtails well and trim any large pieces of fat. Bring a medium stock pot of water (enough to cover the oxtails) to a rolling boil. Drop the oxtails into the boiling water and allow to come back to a boil. Remove from heat and drain in a colander. Rinse immediately with cool water; set aside. Rinse soybeans two or three times in cool water, then place in bottom of crock pot along with ginger slices. Place oxtails on top and add enough cold water to just cover them. Cover crock pot and cook on HI for one hour, then reduce to LOW for six hours. 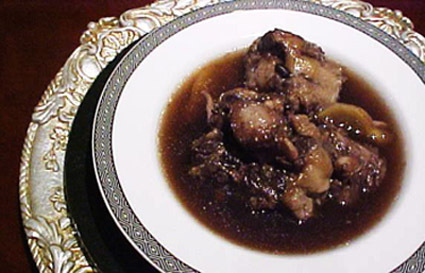 Remove oxtails to a large bowl. Skim fat from surface of the soup, taking away any stray bits of solid fat or meat particles as well. Season soup with salt to taste, about a teaspoon (you don’t want it real salty). Serve soup with or without the soybeans and the oxtails. Traditionally, the oxtails are eaten separately on a plate with steamed white rice, and lots of good dark soy sauce (I prefer mushroom soy) or oyster sauce to dip the oxtails into. 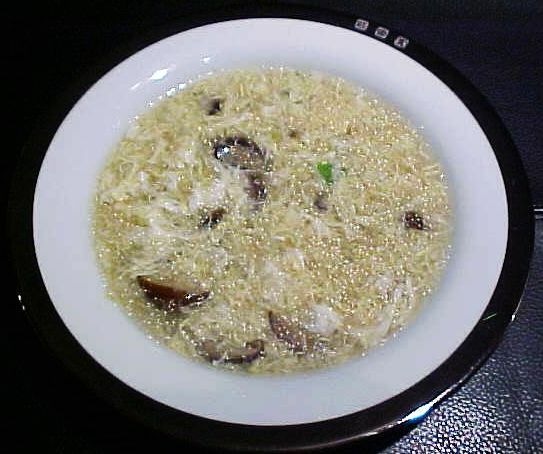 The soup acts as a rich, yet soothing balance to the oxtail meat. 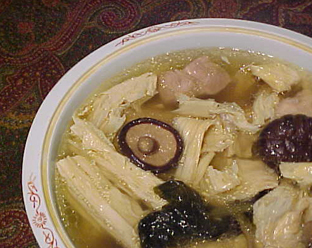 The soybeans color the broth and add a subtle structure to the soup; the ginger provides a zestiness that mellows with the cooking time. The pure, natural goodness of the simmered meat can truly be appreciated here with just a little soy sauce. 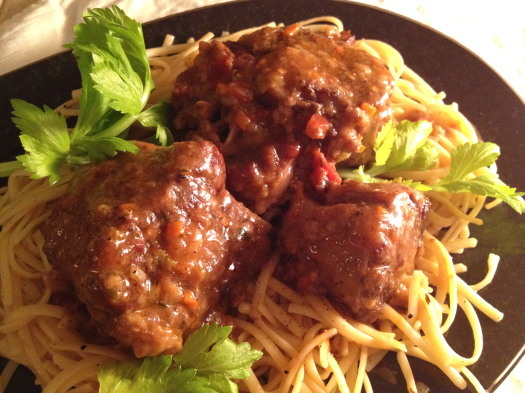 This dish is perfect for the crock pot; oxtails take low, slow cooking to render them tender. The soybeans and ginger also do well at imparting their flavors when cooked slowly. Nice and simple just the way I like it. Great recipe.